← Discovery Monday- Lickety Split! If you met Jaxon at a trial, you would think he’s a yapper (sad face). However, if you met him at home, you’d be surprised at how quiet he is. I certainly thought he was such a quiet one that we’d have to encourage him to speak up sometimes. One of the early tricks I taught Jaxon was to “Speak”. I watched a TV program about dogs that perform on TV, and thought Jaxon would make a great TV dog (no offers yet). The thing that made me think was the fact the trainer was getting the dog to do certain actions at a distance. Eventually, “Speak” became a trick that worked 2-fold. It got Jaxon to speak up, and it taught him not to bark at us other times. As with any training I do, 5 minutes at each end of the day and continue that one focus (among other training) for a week is a great way to keep your pup interested, give them time to think & have fun each training session. Have some yummy treats ready for your pup, and a clicker. Have them in a sit or down position – which ever you prefer. Throughout the exercise, your dog should have eyes on you, and not be playing around barking at other things. I taught this trick to Jaxon in a down position. So now he always lies down before he speaks. With your food in hand, wait for pup to get a bit restless. Your pup may start to mouth and whine – you need to wait as this escalates into a bark. Your pup may already bark at you to try and get the food – even better! This is a great chance to turn a behaviour into a trick! The key here is to let the pup work it out for themselves. It may take a while, so be patient, and try not to lure them into a bark. Wait till they do actually bark, then click and treat (or yes marker word & treat). Encourage any sign of escalation to a bark. So “yes! good dog!” for a louder whine, and a BIG celebration and jackpot when they do bark. Wait patiently for the first few times. Once your pup connects the behaviour with the reward, they will gain consistency quickly. Once you start to get this behaviour consistently, you can build in your marker signal, and finally the marker word. My marker signal is with my right hand next to my face, and my hand opening and shutting like it has a puppet on it. For budding TV dogs, you really want to get that hand signal working for you, as you wouldn’t be allowed to speak commands to your dog on set while filming. 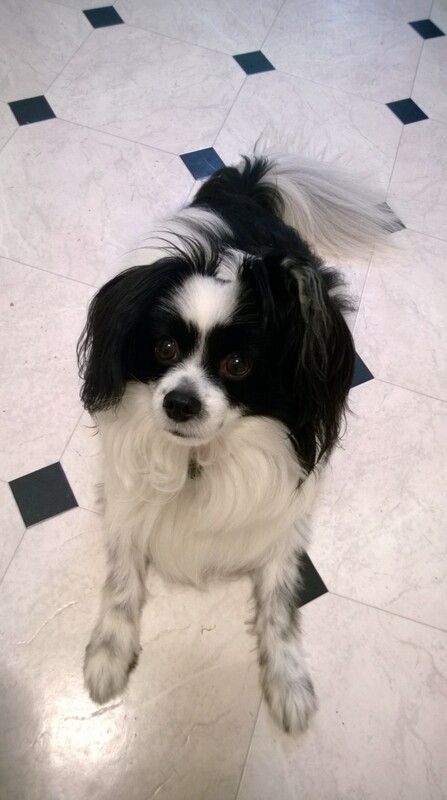 Posted on February 19, 2014, in Fun, News, Training, Tricks and tagged agility papillon, dog training, dog tricks, papillon, puppy training, puppy tricks. Bookmark the permalink. Leave a comment.